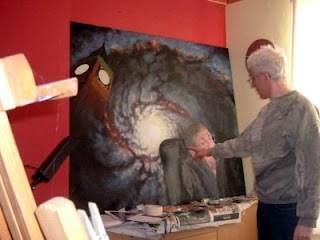 I met Prof. Stephen Hawking in Cambridge (UK) on June 4, 2008 after he kindly agreed with my proposal to do his portrait. I had this project in mind since the time I saw one of his painted portraits at the National Portrait Gallery in London : I was appalled (so was he I learned later). It showed him as a "poor handicapped" with a sad grin in front of a scribbled blackboard. It wasn't fair! Hawking is a survivor. Because of his condition he should have died decades ago. Not only didn't he die but he helped revolutionise science! He has become a celebrity but unlike many "famous people" he deserves it. He is an inspiration not only for the handicapped but for those, like myself, who are lucky to be "normal". His muscle paralysis prevents him from doing all what we take as granted. His cheek movements are measured by a device connected to a computer which is how he communicates now: writing 2-3 words a minute, yet he has written best-sellers! My idea for a fair portrait was that it should induce us with a sense of admiration and respect, not "commiseration". Moreover, a portrait wouldn't be fair if we avoid what has been the center of his entire life: Science. So my idea (and I believe I am the first portraitist attempting this) is to include visually some of his scientific theories and concepts. Most famously is his research on "black holes", the "Big Bang" (with R. Penrose) and his attempt to reconcile the “macrocosmic” laws of Einstein's General relativity (e.g. Time and Space are modified by Strong Gravitational fields) and the “microcosmic” laws of Quantum Mechanics; "Black holes" (as the "singularity" in the Big Bang theory) being the best "place" where such a "reconciliation" would occur. These questions have given rise to many ideas, one of the most promising "Theory of Everything" being the "String Theory". So, after many attempts I came up with the idea of a monumental portrait (1.5 x 1.2 meters) to give a sense of the magnitude of the phenomena Hawking is dealing with. The backdrop is a famous galaxy whose center, possibly a black hole, dents locally the canvas (as a "brane") of the painting and hereby affects our immediate reality (represented by Big Ben whose time is modified by the Black hole/Galaxy). Hawking's face appears, partly hidden, with an ironic smile. Reading his books helped me to realise that he has a real sense of HUMOUR! For the record, today I have redone completely Prof. Hawking's portrait. The composition wasn't working well. But hey, that's life, at least mine and since I have the ambition to do the best portrait of S. Hawking ever... It takes what it takes. Stephen - Would you like to have a new portrait of yourself? Yves Messer is considered a good portrait artist and lives in Ely. I am an artist specialising in portrait painting. I am writing to propose my painting a portrait of Professor Hawking which would be very different in approach to those undertaken up to date. Believing the Professor to be an inspiring figure, not unlike a Beethoven in refusing to be defined by his physical limitations, I have been isappointed by those portraits which have focused on the Professor as a 'sadly handicapped' intellectual. When I saw his portrait displayed at the National Portrait Gallery, my decision to work on a portrait of Professor Hawking which would bring together both the man and the thinker, was confirmed. This great thinker is wrestling with the quest of a 'Theory of Everything'. A portrait that avoids such difficult concepts won?t do justice to the man he is. As I see it, his portrait will be human, dignified and inspiring. I hope I will be able to catch his expression when working hard on a fundamental scientific problem. artistic minds to grasp scientific concepts. Leonardo da Vinci has proven the second limit not to be a valid one. As to the first, physical limit, I am afraid we know it is impossible to 'visually illustrate' concepts pertaining to sub-atomic level, black holes, not least the 'Singularity'- the origin of our Universe. Yet I wish to give visual understanding of these concepts to the public; probably the most challenging concepts for this new Millennium. During Leonardo da Vinci's time, a scientific solution was discovered to express visually a 3D space onto a 2D space: the use of projective geometry (perspective), where 3D space appears ?bent? onto a flat surface. would /not only physically bend the (black) canvas but also slightly affect the appearance of Professor Hawkings' painted portrait. I would add a painted bent clock, as an ironic reference to Dali's melting clocks, showing how a black hole/dense matter affects not only our Space but our Time too. This 'singularity' would be the equivalent of a 'vanishing point' in a perspective space. This 'visual solution' for Professor Hawking's portrait will be unique, because no artist ever dared to take on such a challenge. All I request is some 30 minutes in the presence of Professor Hawking.